Classic Rock Legends The Lizards Feat. Ex-Black Sabbath, Rainbow, Cactus & Riot Members Release New CD! Classic Rock Legends The Lizards Feat. Black Sabbath, Rainbow, Cactus & Riot Members Release New CD! Special Guest Appearances By Glenn Hughes (Deep Purple), Frank Marino (Mahogany Rush) and Vinnie Moore (UFO)! NYC – The long awaited new album from Classic Rock legends The Lizards, featuring members of Black Sabbath, Rainbow, Cactus and Riot, will be released in September 2015 on Hyperspace Records in partnership with drumming legend Carmine Appice’s Rocker Records. 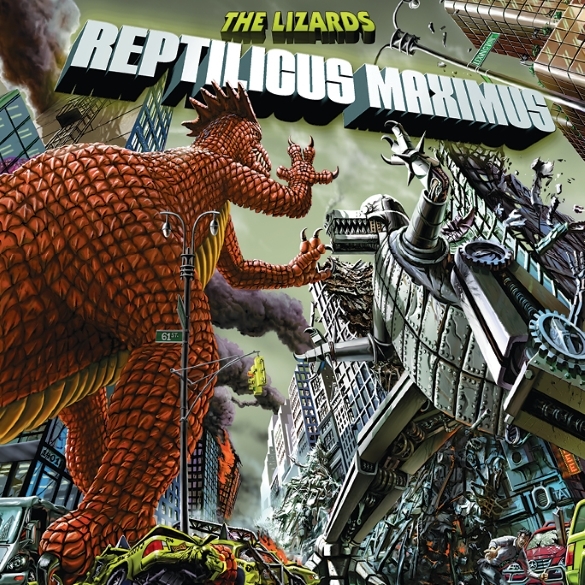 Titled “Reptilicus Maximus”, the band’s 7th album features guest appearances by Glenn Hughes (Deep Purple), Frank Marino (Mahogany Rush) and Vinnie Moore (UFO)! Once again the breathtaking cover artwork was created by longtime Lizards artist Rick Klemann. The Lizards are drummer Bobby Rondinelli (Rainbow/Black Sabbath/BOC), vocalist/keyboardist Mike DiMeo (Riot/Masterplan), bassist Randy Pratt (who also plays harp with Cactus) and guitarist Patrick Klein (who recorded and mixed the album), and have released seven critically acclaimed albums and three live DVDs in the past 13 years. The band’s 2006 release “Against All Odds”, and their covers album from 2009 “Archeology”, garnered rave reviews from fans and music press alike worldwide, catapulting The Lizards into legendary status!